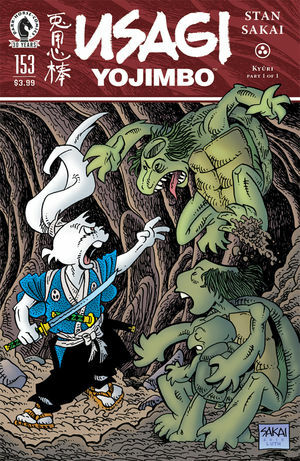 In his effort to save a village, Usagi’s fate takes a turn when he must defend a kappa—a supernatural creature that would normally be his enemy—from an even deadlier threat: a renegade of its own species! The trail leads him to the monster’s lair with his only weapons: two swords and some cucumbers! I'm always excited to see Stan returning to old territory. We haven't seen a Kappa in three decades! And, if it hasn't been said already, I adore the new header that's been in use since Usagi resumed. It's both incredibly visually appealing and informative. I also love that the inside cover now retains the original numbering in addition to the numbering by volume.